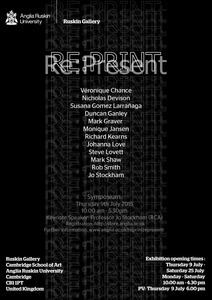 The exhibition and symposium mark the launch of the RE:Print International Research Project with the aim of promoting international networks in discussion, exhibition and exchange. The project was initiated following discussions with academics and artists whose concerns centre on inter-medial approaches to printed media and the nature of reproduction and reproducibility within current art practice. A key aim of the exhibition and symposium is to examine, through practice and dialogue, the impact of continuing technological developments in reproductive media on trans-medial art practice and to RE-Present, challenge, question and connect to previously established relationships between media in unexpected, provocative and radical ways. Technological developments in print media, moving image, sound and performance, have often led to cross-platform dialogue but how are these relationships RE-Presented when immersed in today’s hyper-mediated status of image, sound, and file reproduction? 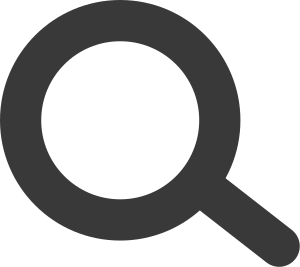 When almost anyone is capable of uploading, downloading, creating, modifying, copying, sharing and deleting files of every and any digitally convertible medium, how does the current frenzy of data use and re-use, challenge our understanding and expectations of image and media reproduction? What kind of spaces or places are constructed, performed or revealed in the process? 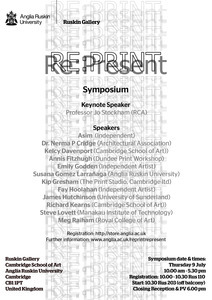 What is the impact on the shared vocabulary across these media: between the notion of a print; of screen interaction; of the nature of collage; of sequence and seriality; of the conception of the unique; of the multiple and the edition or indeed of art and artefact?